So lately I've been a little bit obsessed with wearing pinky purple tones on my eyes as I feel like they really make my blue eyes pop. 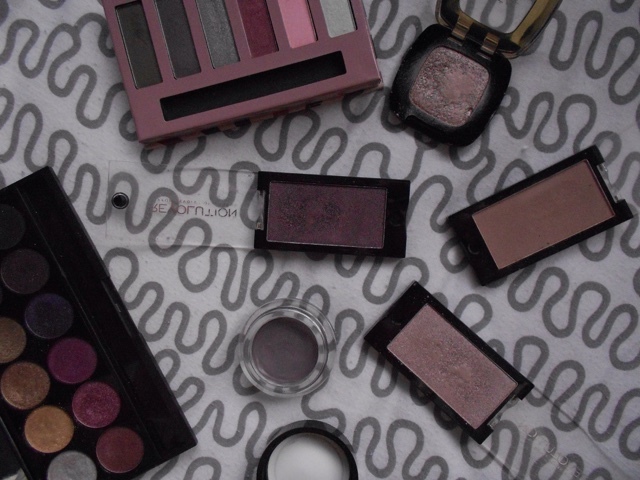 I'm going to be honest the thought of colour on my eyes sort of terrifies me so today I thought I'd show you some of my favourite almost neutral pink and purple shades. Now I'm going to start with the palette that I actually wont shut up about at the moment. If you are a regular reader you're all probably completely sick of me talking abut it but I thought I'd just pop it in one more post to make sure you know it's amazing. 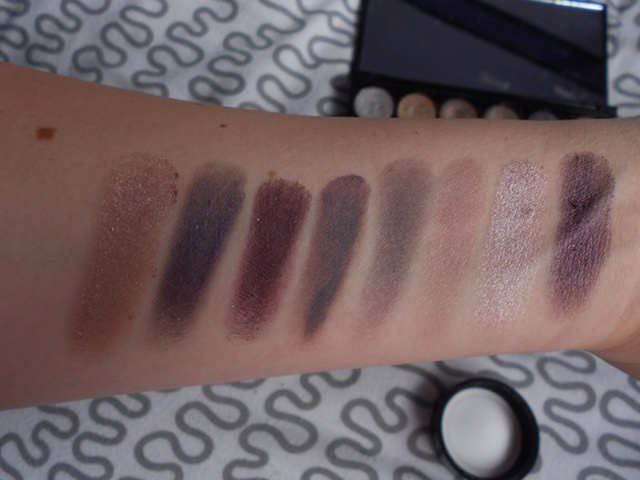 The two purple shades I love out of the Sleek Vintage romance palette are the 4th and 5th shades on the bottom row. The 4th shade is a beautiful metallic grey purple which look beautiful on the lid as it has a slight duo chrome to it. The 5th shade is a stunning plummy matte colour with lots of silver shimmer in it. I love this one in the crease of a gold shade to add a pop of colour. 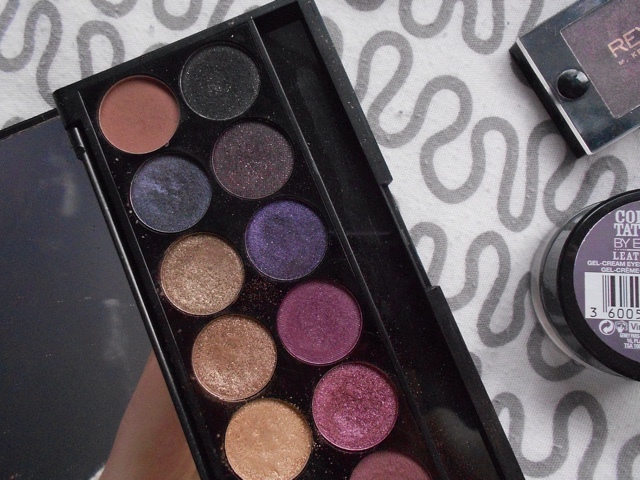 I really love the Makeup revolution shadows and these three are no exception Hung up is a gorgeous taupe-y purple which makes a really lovely transition crease shade for a purple smokey eye I also love it through the crease when I have Good life all over the lid which is a really pretty frosted pinky purple. Finally the brightest shadow in the post Insomnia is absolutely beautiful. Once again a metallic finish it look gorgeous all over the lid with a black in the crease but it also looks nice subtly blended through the crease of a shade like good life. I've been loving the colour Riche shadows from L'oreal recently and Café saint Germain has to be my favourite. It reminds me of Good life but with much more taupey purpleness (top beauty blogger description there) These shadows are so beautiful and I love to wear this one alone as just a slight wash of colour. The Manhattan Vintage romance palette is lovely if you can manage to get your hands on it. They aren't the most pigmented of shadows however if you just want a little subtle hint of colour they are perfect. I like to use the 2nd shade in as a super subtle crease shade if I don't want a super dramatic look. They do require a little work however if you have the patience you are left with a super pretty subtle pop of colour. Finally I had to include this shade, Maybelline colour tattoo's are one of my all time favourite products and I absolutely love Vintage plum. It's a mix of grey and lilac and it looks beautiful both on it's own just blended all over the lid or as a base for any kind of purple look. As usual it's an amazing cream eyeshadow which doesn't crease. These shades are so pretty. I would really like to start wearing darker colors on my eyes in Autumn. I really like dark purple shade. Well now I want to get myself the Sleek Vintage Romance palette, the shades are so pretty! I love pinky/purpley neutral eye looks!